Summer is about to get a whole lot sweeter, with Australian passionfruit available in store now. Plenty of plump and juicy fruit will be available throughout the season, with a particularly bountiful crop set to hit stores from January. 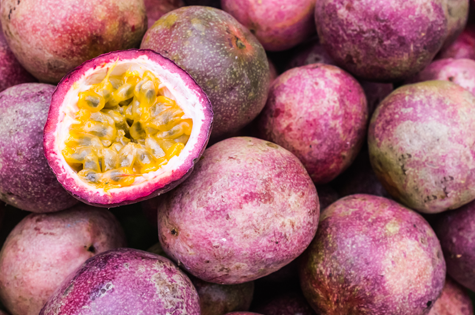 Bursting with flavour, Aussie Passionfruit are the perfect addition to any dish - whether it’s a simple brekky bowl, sweet slice, or refreshing drink. “Get your daily dose of summer by enjoying passionfruit everyday” said McPherson. Weigh it up - Look for plump and smooth fruit that’s heavy for its size – it will have more pulp inside! Crack it open - Did you know you can open passionfruit with your bare hands? Place the passionfruit between your palms, clasp your fingers together and push your palms towards each other to break the passionfruit skin, then pry it open with your fingers. Watch out for the juice! Freeze for later – Make the most of the summer harvest (or January flush) by buying up big and freezing your passionfruit for later. You can freeze the fruit whole, or scoop the pulp into ice trays or popsicle moulds for a tasty summer treat that will cool you down. Health boost - One serve of passionfruit (two fruits) is a good source of fibre (5g), a source of vitamin C (11mg) and low in kilojoules. What better reason to reach for a passionfruit as a sweet snack. 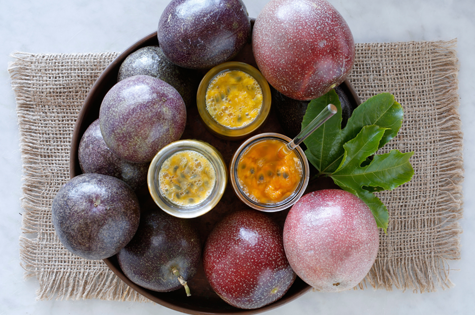 Top it off – Adding Aussie Passionfruit to your dish is a simple way of turning ordinary to extraordinary. With its sweet tangy flavour and bright colour, there’s no better way to top off your dish than with a splash of passion!